Another graphics file format commonly used on the Web is the Joint Photographic Experts Group (JPEG) compression scheme to minimize graphics file sizes. JPEG images are full-color images (24 bit, or "true color"), unlike GIFs that are limited to a maximum of 256 colors in an image. Thus there is a lot of interest in JPEG images among photographers, artists, graphic designers, medical imaging specialists, art historians, and other groups for whom image quality is paramount, and where color fidelity cannot be compromised. 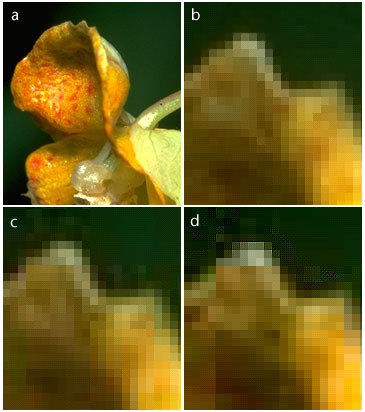 The figure above shows an original photograph (a), and three detail views at different levels of JPEG compression: "excellent" quality (b), "good" quality (c), and "poor" quality (d). Notice the boxy quality of the image in (d). The checkered pattern and the dark "noise" pixels in the green background are classic JPEG compression artifacts. Below is another look at JPEG compression. The top image is an interlaced GIF. The middle is the same image as a JPEG file, compressed in Photoshop at "medium" quality. The bottom dolphin is also a JPEG image, compressed at "poor quality." Note the extensive compression noise and distortion present in the bottom dolphin the savings in download time are not worth the cost of ruining your images. Once you compress an image with JPEG, you have lost data and can never recover it again, so always save an uncompressed original file of your graphics. A new form of JPEG file called "progressive JPEG" gives JPEG graphics the same gradually-built display seen in interlaced GIFs, but most image editors still do not yet support progressive JPEG files. (Debabilizer 1.6 for the Macintosh is one of the few). Like interlaced GIFs, progressive JPEG images usually take longer to load into onto the page than standard JPEGs, but do offer a quicker "preview" to the reader.